As the jet lifts off, I think of scraps of lumber in a little boy’s hands becoming convincing, if not outright flying machines; of a young man lying about his age to get a pilot’s license at the fearless age of fourteen! Considering the force that was his father, how brave indeed to work and pay for secret flying lessons until his sister “outed” him at the dinner table, resulting in my father’s family’s launch into a lifelong love of take-offs and landings. How fortunate that this love of riding the wind was passed along to me and much of my kin. But more than this heady inheritance, is the pure awe in the very fact that flight is possible and that I had the good fortune to be born to this, and in this time. So as I make my way back home with my head literally in the clouds, I fly carrying the promise of new memories with those awaiting my arrival … and feel the loving breath of those spirits who accompany me here on the journey. 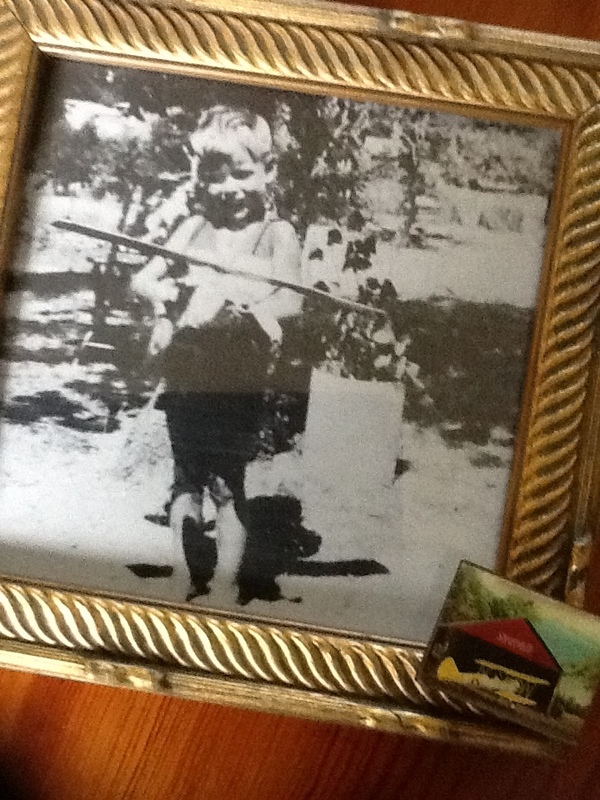 Photo of my daddy, R. Denny Garner, at about age 5 with what would be one of many of his homemade airplanes. Small enamel pin is a painting of Daddy’s Stearman, by one of his flying buddies, Sam Lyons.